The 8th Round Hayling ‘Flag’ Rowing Race takes Place Sunday 17th June 2018; 13 miles of hard and challenging waters in the 2 Harbours and the Solent, for fixed seat Coastal Rowing Boats. The race is for Coastal Rowing boats raced over a 13 nautical mile course around Hayling Island (always subject to the weather conditions on the day). It is run as a single race with handicaps for different classes of boat. The 13 mile course takes around 2 to 2.5 hours to complete for Gigs and Galleys. 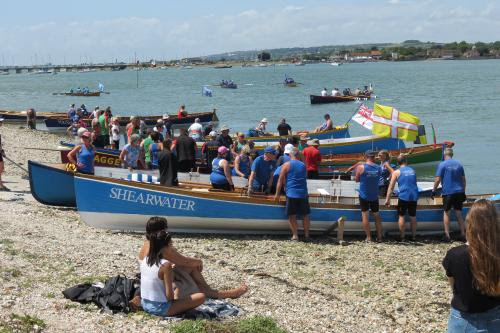 A not-for-profit event, all proceeds are shared between the supporting Clubs and Langstone Adventure Rowing in order to promote and develop Traditional Coastal Rowing in the 3 harbours and the Solent. Other fixed seat craft capable of rowing in the testing waters of the open sea harbours and the Solent.